The Apple iPhone 6 16GB is bigger and has more features than previous models. The device is larger, yet thinner. It is more powerful, while also being power-efficient, which makes it a new generation of the familiar technology. This refurbished AT&T iPhone gives you many options, including an MP3/WAV player and voice over LTE. There is also a rear 8 megapixel iSight camera with autofocus and a 1.2 megapixel FaceTime camera. This locked iPhone 6 comes with built-in apps, as well as a talk time of a full day and 384 hours for standby. It has a beautiful 4.7" retina HD touchscreen display with a 750x1334 resolution for brilliant visuals. 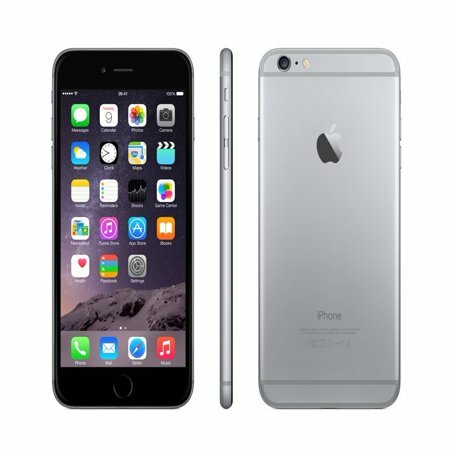 This Apple iPhone 6 makes an ideal gift for technology lovers. Phone came on time,No scratches or anything.Just like brand new.I love it!!! This item was just as expected! You can see that it was in a case (there are some minor scratches but the screen was clean. Comes with charger. Phone came with internal issue. The phone wont do anything. The phone service did all they could on there end and agreed I received a bad refurbished phone. 1. No, it is not an AT&T device. Will this work with cricket wireless? 1. No, this model is GSM and cricket wireless requires CDMA models. 1. This phone is iPhone 6.